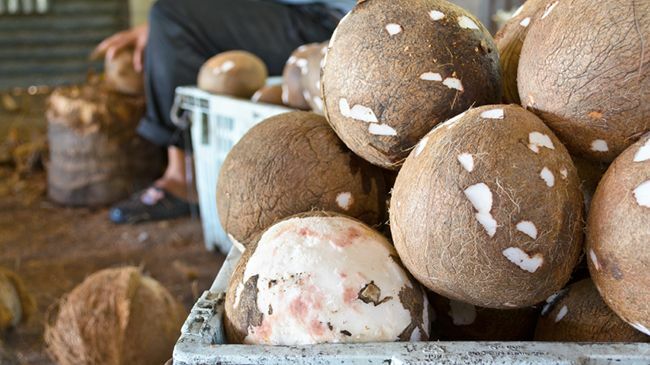 The Great Coconut Oil Debate: Does It Have Proteins? Apparently there is a big time debate going on about whether or not some natural oils contain proteins. If I am wondering, then I am sure others are as well, but there is so much information being thrown around that it often becomes confusing or overwhelming. The biggest debate revolves around the fan-favorite coconut oil and whether it has proteins. I understand that coconut oil is an indispensable Holy Grail for many naturals and curlies, so I inquired with the experts for some much needed clarification. Yes…if contaminated. Wait a minute…what? According to scientific consultant Yolanda Anderson, M.Ed., essential oils are created through distillation, which is a purification process that separates substances from one another via condensation or evaporation. Proteins are destroyed as their bonds are broken down during the process of distilling. Beyond distillation, proteins have even bigger issues than just the separating of the substances. Dr. David Stewart states, “The range of molecular weights that can pass through distillation ranges up to 500 amu. Proteins and enzymes have molecular weights that range well above 10,000 amu.” Remember that without hydrolyzing proteins, they are too large to penetrate and adsorb to the hair cuticle. They are too big to pass through the purification process and cannot fare the process itself, but if an oil is cold pressed there may be the presence of proteins remaining from the flesh or pulp of the fruit, herb, or plant. I mentioned them being immense because even if they are present during cold pressing, they would still be unable to penetrate the hair cuticle or even administer to the cellular level, the way a distilled oil would. So even if present, they would not be benefiting your hair in the same way as hydrolyzed proteins that have been broken down. So, if you are protein sensitive, then oils are the least of your concerns. So even if present, these proteins would not be benefiting your hair in the same way as hydrolyzed proteins that have been broken down. If an essential oil is distilled, then proteins are not present, as they cannot pass through the distillation process required to yield the essential oil. They are too big and may even end up being demolished by the process. There are techniques, such as cold pressing, where proteins may be present but they are too big to actually penetrate the hair’s cuticle, bond, and temporarily rebuild it. You run into a similar problem with carrier oils or at the very least coconut oil, as its process requires heat, which removes the proteins. So, yes some oils contain proteins but regardless of how the oil is extracted, they are too large to bind and strengthen the individual strands.